Panic attacks needn’t rule your life anymore, thanks to the latest advances in science! 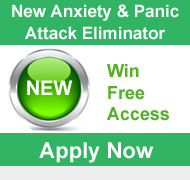 At last, advanced techniques that beat Anxiety, Panic Attack and its progression Agoraphobia, fast, effectively and without drugs are now available to you. We have successfully helped numerous people just like you, whether their symptoms were only just surfacing, or so severe that they were virtually prisoners in their own homes. Safe and effective, our techniques get rid of panic attacks fast. View testimonials from clients who have been helped by BeOnForm. ....we will come to you! How can BeOnForm be of service? We are all individuals and as such each client will have needs unique to them. BeOnForm staff will discuss your needs and agree with you the most appropriate panic attack treatment. We believe in treating the cause rather than the symptom and use therapies designed to remove anxiety, panic attack and agoraphobia at the deepest level possible. Treating you with utmost confidentiality and professionalism, you will find us understanding and compassionate.